The Burns – Night is over and so is (we hope) the worst of the winter. The “hill garden” behind the Flax Mill is a mass of snow drops – the messengers of the coming of spring! We have started 2019 well- besides May and September January is traditionally our busiest month – no exception this year – with a new “Millie” joining our small team from this week onwards we are working hard. It’s finding the balance between making some stock for here and pleasing our customers – the wise ones are stocking up now rather than later on when some of our fabrics are running low. Just like the “up” in hand-spun wool (see our last mail-shot) and the now very serious talks about the return of a linen – spinning plant, the fact that Jeff Swan is back to dyeing yarn (not on a huge scale but no single cones either…)is a step forward. 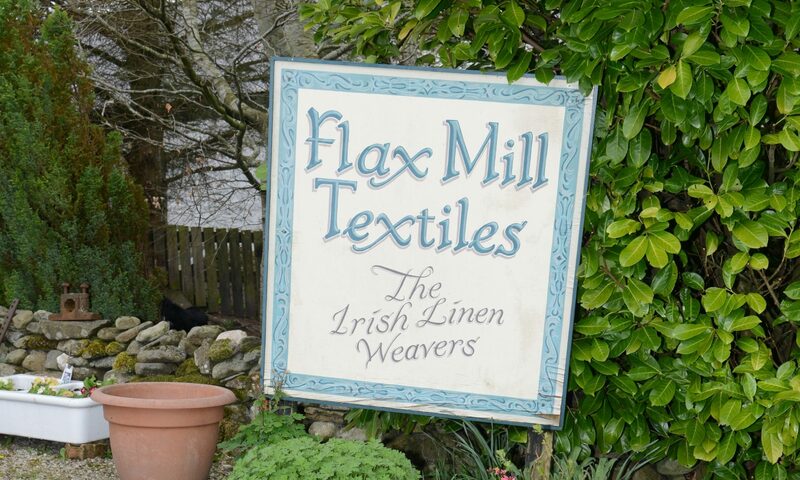 It would not be Jeff if the results weren’t superb – as we write this the first batch of 8’s lea yarn (old stock, spun in Tandragee) which the master had his hands on is being woven into table – ware here at Flax Mill. The depth of colour is outstanding; a “Royal Blue” has been my favourite so far, some red is on the way. Great to see Jeff back in operation – you will like the outcomes when you next call here. – Flax Mill Open Day 2019 booked out as far as crafter’s stalls are concerned. We won’t give away too much at this stage but take that from me: Sat., September 14th 2019 is going to experience a gathering of superb master – crafters, artists, designers and textile – workers from all walks of the industry and from all over the world the likes of which you have never experienced before!! In our next little newsletter we are going to let out the first details. – How many gears has your bike? Since the news about us giving the car a brake (see Hermann’s reflexion “Doing what we say”)have made their rounds some really rare comments, questions and even a pair of boots landed here! My brand new “Holland Bike” has 3 gears, that’s two more than my old “Rally Nova”. To make the long story short: Going back on the bicycle works well at the moment. – Mid Grey is back! This time we had a batch of cloth of the same weight as “Derrylane” died in our second grey – it complements the slightly heavier fabric in deep grey very well. – “Hen’s tooth” in cream/navy also back on the shelf! One of our real timeless linens had to be made again. Very nice finish by the masters in Upperlands! – Very soon: Hand – woven linen beetle-finished! I have made two runs of natural warp/coloured weft cloth of a medium weight which is going to be beetled by Clarks. The warp yarn (really nice stuff, spun by Henry Campbell) has a good shine as it is – when the fabric comes off the beetling engines it should be a real gem! Time for beetling is always hard to predict but the linen should be available from Feb. 10th – as long as stock lasts and not for very long, needless to tell you! – Hand – woven table runners from pure Irish Linen were amongst the bestselling finished products last year; we had to make over 25 % more than 2017. I have just finished a run of new designs in new colours on the Finish fly-shuttle loom. Good addition to our “traditional ones, I think, in the shelf right now! – Last: Many people have asked whether we are growing flax this year. We are and a larger quantity than ever (not huge though, it will be around 4 acres). If you want more details on this, be sure to give us a shout. I hope to meet up with you very soon (the snow drops will only be there for another week or so….) – the tea pot is kept as warm as ever! Just last night we decided to take part in the May Day Steam Rally at Shanes Castle on May 5th and 6th 2019 with the biggest ever “From Flax to Linen” Demonstration. Details on our only appearance outside the mill this year will be out in our next newsletter!